Poster based on the whitepaper: Practical challenges for researchers in data sharing. In one of the largest surveys of researchers about research data, we found widespread data sharing associated with published works, as well as a desire from researchers that their data be discoverable. The survey confirmed and extended recent findings on general data sharing attitudes and behaviour, including those published in the 2017 The State of Open Data Report from Digital Science, to which Springer Nature contributed. 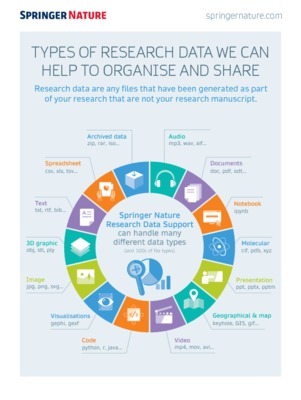 The research presented in this poster (and the corresponding whitepaper) also reinforces previous findings on the challenges faced by researchers in sharing their data. The size of the results (with over 7,700 responses from researchers) allowed us to also explore these behaviours from regional and subject perspectives. Poster presented at Research Data Alliance 11 by Springer Nature on 21/03/18.